Democratic legislators are preparing to take over the influential congressional committees. Here are some facts about those expected to gain key roles in the House of Representatives and Senate. The representative from San Francisco will become the first female speaker of the House, which makes her second in line after the vice-president to succeed the president, if it becomes necessary. 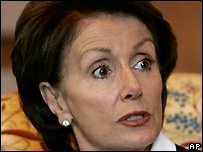 Ms Pelosi has promised to work with President George W Bush and the Republicans wherever possible. But she has said she expects Mr Bush to make a change of direction in Iraq. She has also said House Democrats will push ahead with the rest of their agenda, including funding embryonic stem cell research, imposing a national cap on carbon dioxide emissions and cutting interest rates on student loans. She has played down talk of attempting to impeach Mr Bush over the war in Iraq. The House Foreign Relations Committee presides over all aspects of US foreign policy including diplomatic relations, security, trade and human rights issues. Mr Lantos has promised a more co-operative approach to international relations and has said he will push for direct talks with North Korea and Iran on their nuclear programmes. He has pledged to rebuild the international prestige of the US, but in the past he has backed Mr Bush's policy in the Middle East, has been a staunch supporter of Israel and supported the decision to go to war with Iraq. Mr Lantos has been the leading Democrat on the committee since 2000. 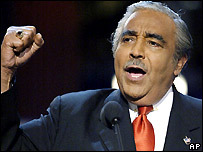 Mr Rangel is expected to close tax breaks that encourage US companies to move jobs overseas. He has said he wants to work with Republicans to show that "expanded trade doesn't always have to mean the loss of good-paying jobs". Mr Rangel is expected to push for more emphasis on environmental and labour issues in trade agreements. He wants to simplify the tax code to eventually repeal Bush administration tax cuts for the very wealthy. Mr Conyers, from Michigan, has been a vocal critic of Mr Bush. He has said he favours hearings into the conduct of the war in Iraq and whether to impeach Mr Bush. With the other minority members of the committee, Mr Conyers last year released a report detailing 26 laws and regulations which they said had been violated by Mr Bush. The Democrat is expected to move quickly against Mr Bush's domestic wiretapping programme, which Mr Conyers has called illegal and unconstitutional. And he may re-open recent legislation authorising military tribunals for detainees of the war on terror. The Nevada Democrat - described as a tough player - has stressed the need for bi-partisan co-operation. "We're going to lead an open government. And we're going to deliver results. From Iraq to the economy, Americans want change," Mr Reid has said. He has said that his party will work with Republicans to "bring oversight and accountability'' to the war and is has also said he will consider supporting a short-term increase in US troops in Iraq. Although Mr Biden voted in support of invading Iraq, he has since become critical of US conduct of the war, calling for a change of course. His plan involves splitting Iraq into autonomous regions and withdrawing US forces. He has also said he wants to focus on North Korea, Iran and the Israeli-Palestinian conflict. Mr Biden, from Delaware, has been a Democratic presidential candidate in the past and still harbours ambitions for the White House. Mr Levin is one of the Democratic opponents of the Iraq war who voted against the invasion in 2002. He favours a change of course and beginning a reduction in US troop numbers there by the end of the year. He has promised to make Iraq and the conflict in Afghanistan his committee's top priorities. 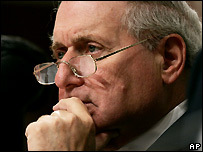 Mr Levin is considered likely to hold hearings into the conduct of the war in Iraq. The 89-year-old Mr Byrd, from West Virginia, is the longest-serving senator in US history, with more than four decades in office. Another outspoken critic of the Iraq war, he will be in charge of approving the funds that Mr Bush requests for the conflict. This will be his third turn as chairman of the appropriations committee. How will Democrats wield power? What will new Congress change?